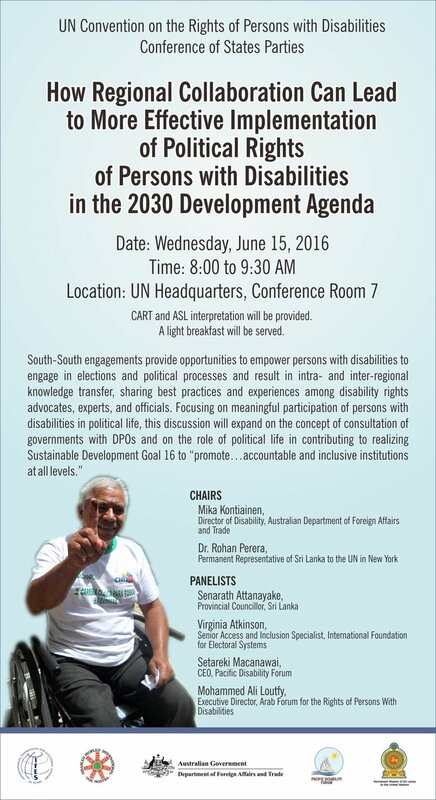 On June 15, the International Foundation for Electoral Systems (IFES), the Sri Lankan Permanent Mission to the United Nations, and Disabled People's International (DPI) will co-host a side event at the Conference of States Parties for the Convention on the Rights of Persons with Disabilities (CRPD). How Regional Collaboration Can Lead to More Effective Implementation of Political Rights of Persons with Disabilities in the 2030 Development Agenda will address intra- and inter-regional knowledge sharing among election officials and disabled persons' organizations (DPOs). For more information, please see the flyer above or the plain text below. CART and ASL interpretation will be provided.